Color on my Asian pears, the varieties Chojura and Yoinashi, is becoming more vibrant, which is their way of telling me that they’re near ripening. 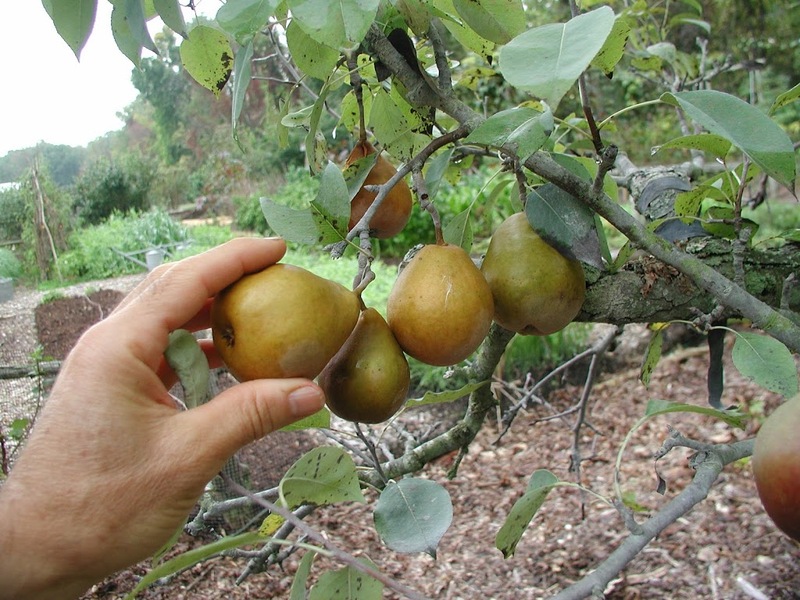 Unlike European pears, Asian pears don’t taste their best unless plucked from the tree dead ripe. When ready, they’re at that lift-twist-separate stage. They’ll need especially careful picking because as a result of last spring’s frost, less than a dozen of the golden gems hang from the branches, making each fruit all the more prized. The tree fruits highlight what a strange growing season it has been. Besides the dramatic early warming last spring and the dramatic freezes that followed, the growing season got started early and has been unusually hot. The upshot is that everything, fruitwise, is advanced ahead of its usual schedule. Magness pears typically ripen for me around the middle of September, with Chojura beginning soon after. This year, all these fruits are ripening about 2 weeks early. 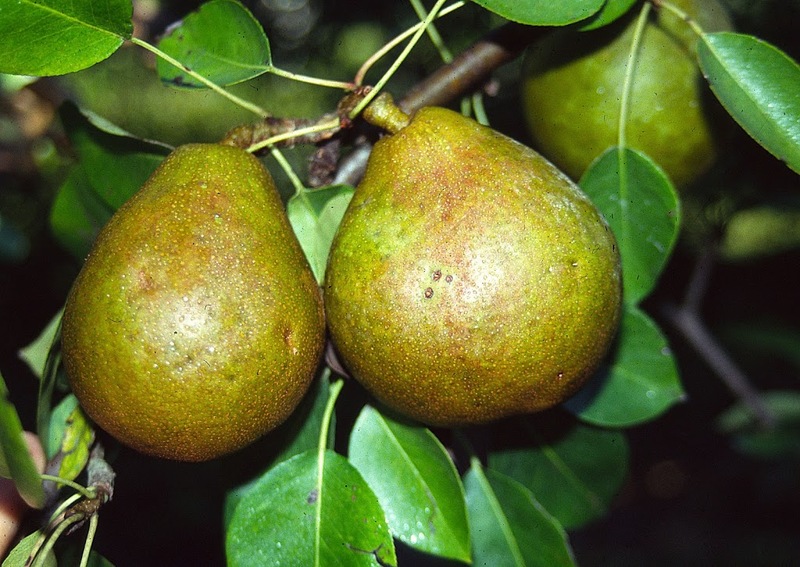 A hot season and early ripening could effect fruit quality, especially of pears. Some varieties taste best following warmer summers, others during cooler summers. Temperatures during ripening also have an effect on quality. It’s known that hot temperatures in the two months preceding harvest bring out the best flavors in Bartlett and Bosc pears, and that Anjou pears like it cool. The effect of temperature on the more obscure pear varieties, which are what I grow, is not well elucidated. Time, beginning in 2 weeks, when tasting begins, will tell. This morning I was scything some tall grass and weeds beneath my persimmon trees in anticipation of their ripening. Mowing exposed a ripe, orange persimmon couched softly among stems and leaves on the ground. And then another one, and then another. I looked up and confirmed that Mohler persimmons are ripening. 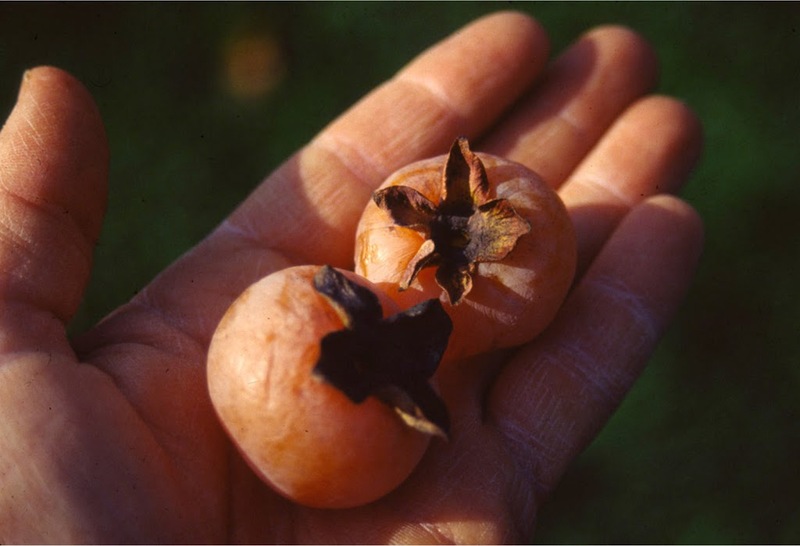 Mohler is one of a number of varieties of American persimmon that are cold hardy and will ripen their fruits this far north. My persimmons have survived winter lows below minus 20 degrees F.; Asian persimmons, which you find in the markets, are not nearly that cold hardy. The flavors differ also. American persimmons are drier, with richer flavor, the best varieties having taste and texture something like a dried apricot that’s been soaked in water, dipped in honey, and given a dash of spice. Mohler is not available from nurseries. I made my tree by grafting a stem of Mohler, which I got from someone named Mohler in Pennsylvania, onto an American persimmon seedling. I was able to hook up with Mohler through North American Fruit Explorers (www.nafex.org), a fun organization of fruit nuts who write about their fruit adventures, home and afield, and exchange plants. Mohler, as well as my Szukis, Dooley, and Yates, American persimmons (the others are available from specialty nurseries) are very reliable and easy to grow. Mine have never succumbed to late spring frosts and the mature trees require no spraying, pruning, or any other care. They’re among the fruits highlighted in my books Uncommon Fruits for Every Garden (Timber Press, 2004) and Grow Fruit Naturally (Taunton Press, 2012). To experience firsthand the possibilities in home-grown fruits, come to my workshop BACKYARD FRUITS: A TASTING AND A WORKSHOP, which will be held here at my farmden. Learn how to grow delicious fruits organically and then taste some that are in season, such as pears, grapes, pawpaws, persimmons, and kiwifruits. The workshop is Oct. 6th, 2-5 pm. Contact me for more information and registration. How do you manage the chickens under your fruit trees? Do you use portable fencing? I don’t really manage my chickens in any way except to keep them out of my vegetable gardens with a 4 foot high fence. The chickens roam around anywhere they want otherwise. They do like the mulched areas beneath the fruit trees and hopefully are doing me some good there. You have the most timely posts! I’m researching European pear varieties since I discovered that my husband loves canned pears. (Fond childhood memories at his grandmother’s house.) Since he doesn’t enjoy my gardening activities normally, it was a big step for him to ask, “You planted pears this spring, right?” in fact, I didn’t. I know you aren’t huge in the preserving department, but do you know anyone who has favorite varieties for canning? I have heard Comice and Magness really don’t can well, and turn to mush. Currently, I’m thinking about Colette, but I’d be glad to hear more suggestions! You’re right about my not being big in “the preserving department” (except for canning and drying tomatoes, and freezing some vegetables and fruits, and making sauerkraut. As far as pears, I know that Kieffer has been used for canning, but that may be also because it’s not that good fresh. I think Bartlett pears are also sometimes sold canned, so might be good. Your book Uncommon Fruits… set my desire to garden ablaze nearly 10 years ago. I now grow nearly every fruit profiled in your book, and many others too. I’m interested in the Mohler persimmon. Being that I’m in southern VT, early ripening seems critical to success. I’m presuming based on your post that these Mohler persimmons are ripening for you roughly with Seckel pears– a surefire crop here. Mohler ripens before Seckel here although persimmons probably require more heat to ripen than do pears. Still, I think Mohler would be worth a try in southern VT.
Is Mohler self-fertile? Or does it need a male? I believe it is self-fertile. I get fruit every year and have no males here.My other persimmon is Szukis, which is also self-fertile.